Much has been written about the outrages perpetrated against the natives of Africa, America, India and elsewhere during the ages of Discovery and Colonialism. And, since the dawn of the Age of Independence, much has also been written about the plight of the colonisers, forced out of places they regarded as home and returned to mother countries where they were often far from welcome. In Britain, the dilemma of rubber planters from Malaysia, of old India and Africa hands and their like from all over the former empire is common knowledge. But until recently, little attention had been paid to another of the players in the colonial game, the settlers who stayed on but retained their cultural otherness. 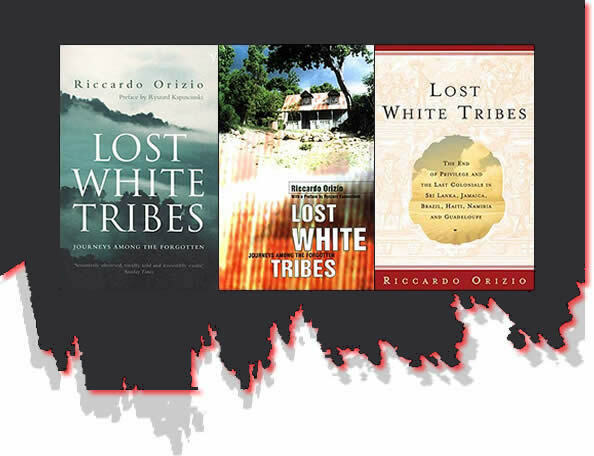 These are the lost white tribes, the forgotten among whom Riccardo Orizio has travelled and who haunt the pages of this moving book. 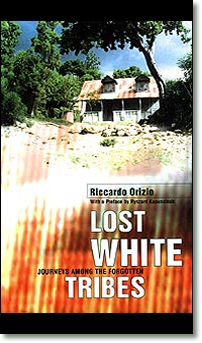 Orizio, a seasoned news reporter and currently editor of CNN Italia, first became curious about these "lost" people when he was in a restaurant in Sri Lanka and noticed that the waiter dressed as a native, but had the face of a European. When he asked his Sinhalese friend where the waiter came from, he was snapped at: "Strange people. Dutch, or something of the sort. Maybe Portuguese. Some of them live in crumbling old houses . . . as if this was still the 18th century. Perhaps, although they're trash, they think they're better than we are." So began an interest that grew into this book. The locations are exotic enough to lure even the most worldweary of readers past the title page: Dutch in Sri Lanka, Germans in Jamaica and Namibia, Confederate Americans in Brazil, Poles in Haiti and the French in Guadeloupe. In Sri Lanka, Orizio travelled in search of the Burghers, descendants of employees of the Dutch East India Company and of the Portuguese settlers who ran the island before them. The Burghers, as their name implies, are people of the town rather than country, but apart from this, their experience is more or less similar to that of the Seaford Town Germans, the Brazilian Confederados, the Namib Basters, the Blancs Matignons and the Haitian Poles: they are an underclass and a divided community, their fortunes, if they ever had any, are at an all-time low, and their young want out. They are also ignored by their original mother country. Orizio points out in his introduction that there is nothing new about this: Afghanistan still has a tribe of Greek origin, established when Alexander the Great stormed eastwards in the 4th century BC. The passing millennia have wrapped these wonderful survivors in romance, but there is something less romantic, more tragic about the state of many of the people Orizio finds. The Poles in Haiti stick in my mind as the most pitiful, buried far upcountry, but still wondering why their very own Pope has not kept his promise, made on a state visit in 1983, to send assistance. The author adds to the sense of tragedy by explaining the shifts in fate that led to their being bypassed by history, irrelevant and lost. It is unusual to read an introduction in which a writer thanks others whose books have been an influence. This is what Orizio has done, and among the authors in his pantheon is Bruce Chatwin. Chatwin also had an eye for the forgotten and, as I read Orizio's stories, I was reminded of his hero's visit to the Welsh community of Patagonia. Like Chatwin, Orizio has a knack of following hunches and finding good people to talk to. He also does his research and provides a history, as well as a social anthropology, of those he visits. But where Chatwin was a master at making shape out of the most disparate fragments, Orizio has left his stories unconnected, has avoided making parallels and never talked to one tribe about the experiences of the others. In a foreword to the book, the writer Ryszard Kapùscinski claims it presents "a completely new map of the colonial world". This is something of an exaggeration, especially considering the lack of structure given to the experiences presented here. What I think Orizio has done, along with other recently published work, including Stephen Taylor's Livingstone's Tribe and Laura Roychowdhury's The Jadu House, is contribute to what might be the last chapter of the colonial story. Kapùscinski calls Lost White Tribes a wonderful piece of reportage, which it is. To that I would add that it is sensitively observed, vividly told and irresistibly exotic.